Home Travel in Korea Top 5 Korean Food Under 10 Dollars! Top 5 Korean Food Under 10 Dollars! 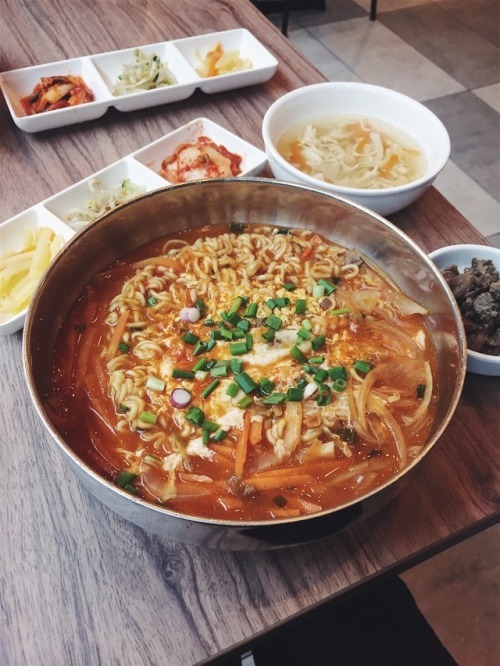 Korea has become one of the major food hubs in Asia as Korean cuisine has also been receiving much love from not only neighboring countries, but also on the other side of the globe. Hallyu Wave played a big part of this cultural promotion. Korean dramas and variety shows are now more accessible to foreigners. Dramas such as Drinking Solo (2016), Let's Eat (2013), Oh My Ghost (2015), Weightlifting Kim Bok-joo (2016), as well as variety shows Youn's Kitchen (2017), and Kang's Kitchen (2017) helped introduce Korean food to its followers. FUN FACT! Most of the Korean food on the T.V. shows are easily available in every corner of Korea. What's more interesting is that, you can get to try them for only 만원 (man-won or ₩10,000 = $10.00) or less! If you're travelling in Korea on a budget, these dishes will definitely fill your stomach without emptying your wallet. Stir-fried spicy rice cakes. These little rice rolled cakes fried in sweet and spicy sauce are Korea's little wonders! Even kids are addicted to tteokbokki! 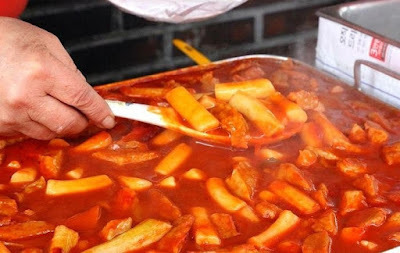 For only 3,000KRW ($3.00) per order, you can eat tteokbokki on the streets, most of the time in front of a school. You can also have it delivered wherever you are for 8,000KRW ($8.00)! You may have a love-hate relationship for tteokbokki because of its spiciness and calorie count, but it will leave you wanting for more. TIP: For people who can't take spicy food, you can dip it in water to wash off some of the hot sauce before eating it. For professional spicy food eater, you can eat it with fishcakes, cabbage and egg. Carp bread. This fish-shaped pastry stuffed with sweet paste is one of the famous street food during Winter. Commonly, bungeo-ppang are stuffed with either red bean paste or pastry cream. Another variation of this sweet treat is the chrysanthemum bread or gukhwa-ppang (국화빵). It has the same filling, but this bread is in different shape. These are sold at street stalls at 1,000KRW ($1.00) for 3 pieces. If ahjumma or ahjussi is in a good mood, they can give you up to 2 more pieces for free! Noodles in black bean sauce. Originally from the Chinese, this noodle dish topped with a thick sauce made of chunjang, diced pork and vegetables. Amazingly, Koreans founded an informal holiday to eat jjajangmyeon. Every April 14, Koreans celebrate "Black Day". Black Day is a special lonely day for singles, particularly those who didn’t receive anything from anyone on Valentine's Day and White Day. For as low as 4,000KRW ($4.00), you can enjoy a bowl of jjajangmyeon in a Chinese restaurant in Korea. Some restaurants offer a mini size of tangsuyuk (탕수육) priced from 8,000KRW ($8.00). Old-style fried chicken. 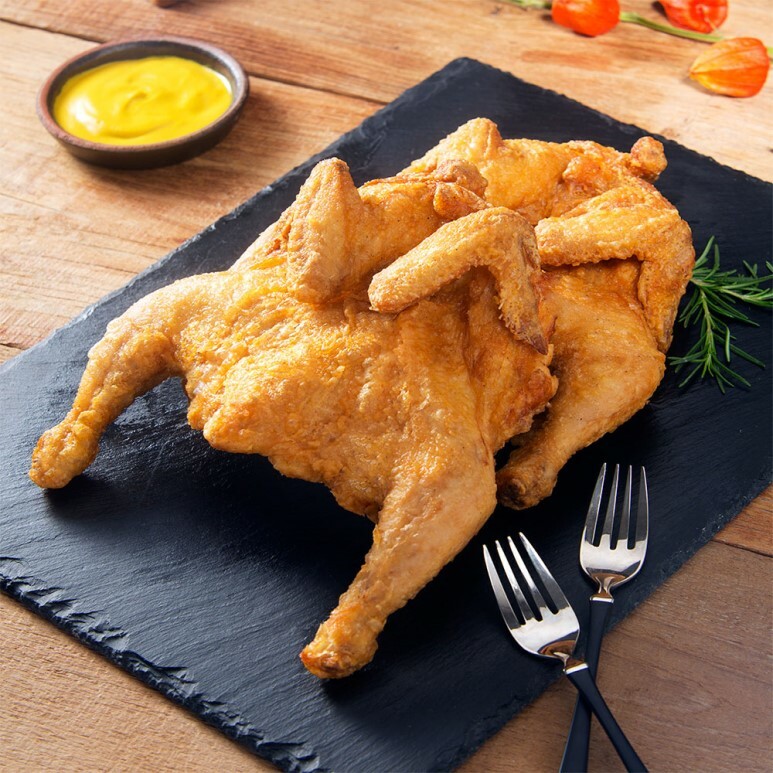 Yetnal Tongdak is a variation of fried chicken. A whole chicken, seasoned in salt and pepper, coated in thin flour, is deep-fried in oil and served as is. In the 70's, Koreans enjoyed eating yetnal tongdak as it is the only kind of fried chicken sold in the country. Nowadays, there are tons of other varieties such as yangnyeom, soy garlic and honey butter. 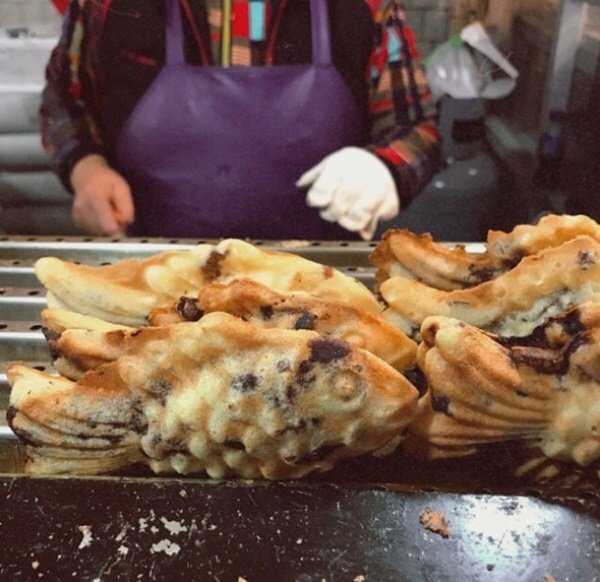 Yetnal Tongdak is sold for at least 8,000KRW ($8.00) in a traditional market. 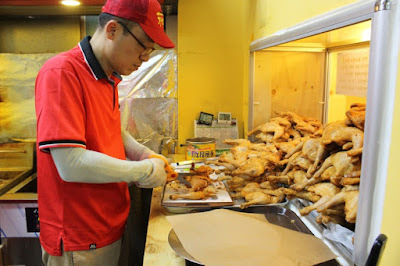 If you're crazy for chicken, you might also want to check-out Suwon's special chicken alley. Instant noodles. Every country has its own style of instant noodles, and Korea's very own is not one to miss. Basic South Korean ramyeon is red and spicy, with or without common toppings such as egg, chopped scallions and chili peppers. You can easily get one at convenience store at 800KRW ($0.80), but for a more legit experience, you can go to a snack bar for 3,000KRW ($3.00). 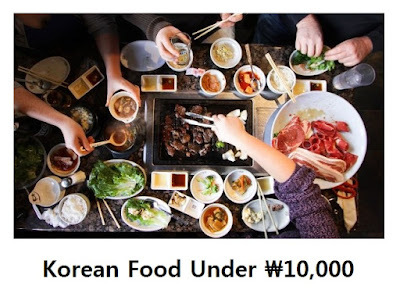 These are just some of the food that you can enjoy for as low as ₩10,000. Watch out for the second part of this post!